Rive sees a “20-year pattern” of Calif. utilities opposing smart clean-energy policy. The solar industry is a classic California success story. The state’s early and consistent support of technology to harness the sun’s energy led to the development of innovative business structures that help maximize solar deployment. This enabled hundreds of California solar companies to grow and provide customers with a cheaper, cleaner alternative that helps meet our ambitious clean energy goals. Today, California is reaping the benefits. The state’s solar industry employs 54,000 people -- more than the state’s five largest utilities combined. These solar jobs can be found in every corner of the state because each home, school, and business that goes solar must by definition be installed locally. While net metering is the foundation of every thriving rooftop solar industry in the United States, last week California’s three largest utilities -- Southern California Edison, Pacific Gas & Electric, and San Diego Gas & Electric -- filed proposals at the California Public Utilities Commission to end net metering. To understand the consequences of what they’ve proposed, we need look no further than Arizona. In February, the board of Arizona’s second-largest utility -- the Salt River Project (SRP) -- voted to impose “demand charges” and other fees that discriminate against residential solar customers, over the objections of the solar industry, just as the California utilities have proposed to do. Within a month, rooftop solar adoption in SRP territory fell by 96 percent. The utility maintained its monopoly, while the solar industry was virtually banned by utility fiat. As an unregulated utility answerable to no one, SRP was able to do exactly what was in its own interests, and it didn’t hesitate to cause damage to the local economy to serve those interests. Like SRP, California utilities now propose to implement punitive demand charges on new solar customers, and deny them full bill credit through net metering. No state with a thriving rooftop solar industry has adopted residential demand charges or failed to guarantee solar customers full bill credit through net metering. Unfortunately, the utilities’ latest action is part of a 20-year pattern: nearly all of the smart clean-energy policy choices California has enacted have been opposed at some key point by the largest utilities, from increasing the renewable portfolio standard to establishing community choice aggregation. They also fought net metering from its inception. In a 1995 letter, PG&E opposed net metering legislation, apparently because rooftop solar requires less costly utility infrastructure to deliver local energy. In 2000, utilities said that allowing a net-metering cap above 0.5 percent would cause devastation. Though the sky didn’t fall, utilities fought the cap with the same arguments at 2.5 percent, and then again at 5 percent, 10 times the amount they’d first cried wolf about. Meanwhile, utility profits continue to increase. The net earnings of California’s three largest utilities increased an average of 21 percent last year. They could do what any other business would do when faced with competition: improve efficiency, reduce their costs, and offer a better product. Instead, they try to crush rooftop solar through government regulatory changes. Two years ago, the legislature passed a bill directing the CPUC to ensure “total benefits…to all customers and the electrical system are approximately equal to total costs” when it develops the new program for rooftop solar. Total benefits, not partial benefits. The utilities are pushing the CPUC staff to not include all the benefits, however, in order to gain approval of their proposals to end net metering for new customers. It comes back to choices. If the utilities’ proposals to end net metering are approved, the state will signal that the industry it has helped build, that is immensely popular and employs tens of thousands of people across the state, may be ended for the benefit of monopoly utilities. Our leaders can make the right choices. The next chapter of this success story lies in their hands. 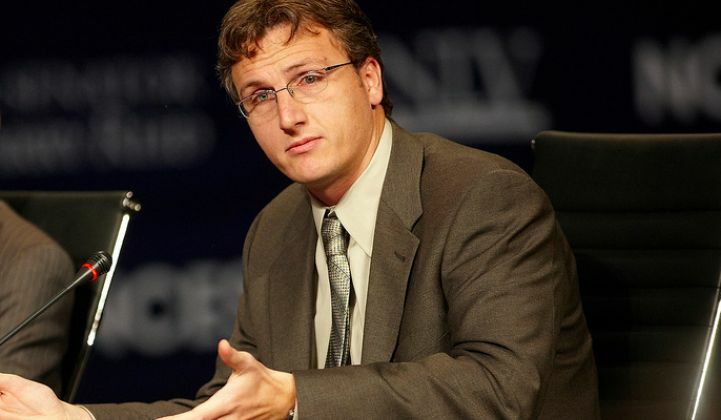 Lyndon Rive is the CEO and co-founder of SolarCity.